A very good morning to all of you. I am extremely honoured to be here for the Justice Krishna Iyer memorial lecture of 2016, and I would like to thank Justice Ramakrishnan and Mr Sahasranaman for having invited me on behalf of the memorial trust. Naz Foundation/Section 377 judgment borrowed liberally from ideas first voiced by Justice Krishna Iyer. When I was made the chairperson of the Law Commission of India, there was an initial trepidation on my part, because Justice Krishna Iyer had served as a member of that illustrious body, and rendered some very distinguished/important contributions. The Twentieth Law Commission’s final report on the death penalty was essentially inspired by his writings on the subject, and we extensively quoted him in the report as well. In today's talk, I seek to examine the issue of judicial appointments, which has had a chequered history dating to the creation of the Indian republic itself. Part IV, I conclude with a discussion on the way ahead, after all this water has flown under the bridge. highest integrity” and who would be “[persons] who can stand up against the executive government and whoever might come in their way.” The assembly agreed that the judiciary’s “independence” was important, but not its “insulation”. These debates saw fruition in the form of Articles 124 and 217 (for appointment of Judges to the Supreme Court and High Court respectively) that embody a consultative system of appointment of judges – one where the power, although residing with the executive was exercisable only after consultation with the Chief Justice of India for Supreme Court appointments, and the Chief Justice of the High Court for High Court appointments. It was felt that a multiplicity of high constitutional authorities, some of whom were apolitical, would ensure that judges of the highest quality would be appointed. virtually had a veto power over appointment decisions.” From the 1970’s onwards however, Indian constitutional framework changed in response to political actions, ultimately resulting in the Supreme Court seizing the power to appoint judges (in the 3rd Judges Case discussed later), in effect, accepting the proposal rejected by the Constituent Assembly. This usurpation of the power by the judiciary coincided with the weakening of political power at the Centre and happened in several important steps. Kesavananda Bharati v State of Kerala, where an unprecedented 13-Judge Bench of the Supreme Court held, by a slim seven to six majority, that the Constitution had an ‘unamendable’ or entrenched ‘basic structure’. The very next day, All India Radio announced that the next Chief Justice would be AN Ray, the fourth most senior judge of the Supreme Court at the time, effectively demolishing the convention of seniority followed by the Court since its inception. Law Minister Mohan Kumaramangalam proposed a reinterpretation of the process of appointment of Judges. According to him, the political philosophy of judges should be in consonance with the spirit of social justice ingrained in the Constitution, which, in turn, should be assessed or determined by the executive. This argument was merely a protective garb under which the government steadily attempted to reshape the composition of the judiciary. A 1976 order to transfer sixteen judges of various high courts was set aside by the Gujarat High Court as the CJI had not been consulted. Before it reached the Supreme Court, the matter was settled between the parties. However, Justice Bhagwati, in his decision, recognized that independence must be holistic and not limited to pressures from the executive. Meanwhile, in the Habeas Corpus case (ADM Jabalpur), in what is perhaps the lowest point of India’s constitutional history, a 5 Judge Bench of the Supreme Court held that the writ of habeas corpus would not be available to arbitrarily arrested and detained individuals during the emergency. Justice HR Khanna wrote the lone courageous dissent, but paid the price when the Government, after Justice AN Ray’s retirement, instead of appointing Justice Khanna as the Chief Justice being the next senior most judge, appointed Justice MH Beg who was next in the line of seniority. This paved the way for the trinity of cases – the three Judges cases – by the last of which, the Supreme Court completely usurped the power of appointment of judges. The 1981 case of P Gupta v. Union of India, also known as the First Judge’s case, several specific questions were woven together by the concern of whether the opinion of any particular constitutional functionary had primacy in the consultation process for the appointment of a judge. This set the ground for the Second Judges case. dicta expressed in the Second Judge’s case. This led to the Special Reference No. 1 of 1998, also known as the Third Judge’s case. The decision presumed that the primacy of the CJI was an established position of law, but provided no reason for this presumption. The judgment expanded the collegium to four seniormost judges for Supreme Court appointments, and two for High Court appointments. However, the judgment in the Third Judge’s case lacked any detailed textual or normative reasoning, and read more like a policy brief. The Court did not specify how the minimum number of judges in this collegium would safeguard judicial independence and ensure non-arbitrariness. No method of appointment was prescribed – the Collegium had no office, no institutional staff or framework, no mechanism to gather data, and no criteria for selection. The system was ad hoc and shrouded in secrecy. This decision was unique and unprecedented for in no jurisdiction in the world do judges appoint fellow judges. Through the three Judges Cases, the Judiciary usurped the power to elevate justices through a distorted interpretation of Articles 124 and 217 of the Constitution by saying that the word “consultation” would mean the “consent” of the Chief Justice. The involvement of the Executive in the appointment process was excluded. The Constituent Assembly’s view that the Chief Justice as the final appointing authority would be “dangerous”, was completely disregarded. This led to the next phase in the debate on judicial appointments. While I will discuss the collegium system later, but at the time, there was near unanimity that the collegium system of appointments had failed, and we needed a system where there would be transparency and accountability. Accordingly, the UPA government tabled the 120th constitutional amendment bill and the Judicial Appointments Commission Bill in 2013, although both lapsed. Then the NDA government took initiative, and succeeded in seeing through the 99th Constitutional Amendment and the accompanying NJAC Act in 2014, with complete unanimity in both houses of Parliament. The idea behind the establishment of an appointments commission is that it would guarantee the independence of the system from inappropriate politicisation, strengthen the quality of appointments, enhance the fairness of the selection process, promote diversity in the composition of the judiciary and therefore rebuild public confidence in the system. Judicial appointment commissions exist in many democratic countries, like the UK, South Africa, Israel, Canada and Australia. In all of these, the executive has some role in the working of the commission, and civil society too has some presence. For example, the UK commission consists of one Chairperson and 14 other Commissioners, including five judicial members, one barrister, one solicitor, five lay members, one tribunal chairman and one lay judge. Similarly, in South Africa, its 23 members are drawn from the judiciary, the two branches of the legal profession, the national and regional legislatures, the executive, civil society and academia. In the Indian model that was finally enacted, the NJAC was to consist of six members— the CJI, two seniormost judges of the Supreme Court, the Law Minister and two eminent persons to be selected by a committee comprising the CJI, the Prime Minister and the Leader of Opposition in the Lok Sabha. An appointment could be made only if approved by a special majority of five members. However, this Act was struck down by the Supreme Court in Supreme Court Advocates-on-Record Association v Union of India, by a majority of 4:1, as being unconstitutional. The 99th Amendment to the Constitution enacted by Parliament to create the NJAC was held to violate judicial independence, which is part of the basic structure of the Constitution that cannot be amended. The sole dissenting opinion was offered by Justice Chelameswar, who said that while judicial independence was a part of the basic structure, there was nothing in the 99th Amendment to offend it. The basic structure doctrine was first expounded in Kesavananda Bharati which granted the Court the power to examine Constitutional amendments for violation of the ‘basic structure’, and thus, strike down amendments when found to violate the essence of the Constitution. Illustrative features of the basic structure, as discussed in the judgment, included the Supremacy of the Constitution, the Republican and democratic form of government, the Secular nature of the Constitution, the Separation of powers, and so on. Between Kesavananda Bharati and the NJAC Case, the Supreme Court’s examination of basic structure has centred on the overarching principles of the basic structure, and not on the components of the individual principles or individual rights themselves. The concept of basic structure evolved over various cases from Indira Nehru Gandhi v. Raj Narain to L. Chandra Kumar v. Union of India. The NJAC judgment suffers from many problems, some of which I attempt to discuss here. One serious problem was with the interpretative process followed by the NJAC judgment. According to the petitioners in the NJAC case, the Second Judges’ Case had concluded that judicial primacy in appointments was an indispensable feature of judicial independence, which, in turn, was part of the basic structure of the Constitution. They argued that the 99th Amendment was invalid because, by doing away with the collegium, it violated the basic feature of judicial independence. The majority court agreed with this argument on two grounds, first, that Articles 124 and 217, which deal with appointments to the Supreme Court and High Courts, respectively, were interpreted as requiring judicial primacy to protect judicial independence; and second, there was a long- established practice of according primacy to the CJI’s opinion. Insofar as the first ground is concerned, undoubtedly, the Second Judges’ Case read ‘consultation’ to mean ‘concurrence’, but there was no finding in that case that judicial primacy in appointments was an indispensable feature of judicial independence. The court nowhere in the Second Judges Case held that judicial primacy was required to secure judicial independence. Surprisingly, Justice Khehar draws an inference that the Second Judges’ Case holds that “primacy of judiciary was a necessary component of judicial independence and the basic structure”, which is clearly an incorrect inference. Secondly, jumping from judicial primacy being a part of judicial independence, and by corollary, a part of basic structure, is therefore, improbable. Arghya Sengupta, in his piece on the issue in EPW argues, that if this were the case, then we could be faced with many more such absurd interpretations. For instance, the right to sleep without undue disturbance from the state has been held to be part of the right to life under Article 21. In turn, Article 21 is part of the basic structure. Applying this same logic, the right to sleep would also become a part of the basic structure. The majority judgment relied on long practice to justify its argument that judicial primacy in appointments was necessary. But a long-established practice alone surely cannot decide whether a particular feature is a part of the basic structure. Further, if practice, over a period of time, can determine whether anything is a part of basic structure, then is the basic structure as basic as it purports to be? The reliance on Dr. Ambedkar’s views in the Constituent Assembly by the majority is really baffling. The judgment problematically interprets Ambedkar’s intention to be to assign primacy to the judiciary. But Ambedkar’s speech, which I quoted earlier, clearly shows that the framers wanted a well-balanced system. What they wanted to avoid was executive dominance, and not remove the executive entirely from the process. Additionally, the NJAC judgment does not address the idea of the judiciary being solely responsible for appointments, without any accountability mechanism for the decisions of the collegium. Surely, as much as an independent judiciary might be a part of the basic structure, so too must the principle of checks and balances be an equally important part. Next, the idea that judicial primacy in appointments is the only way to secure judicial independence is unjustified. Not only did the judgment not explain as to how judicial primacy would help secure judicial independence, it also made no effort to define judicial independence itself, which would be a foundational requirement for any such argument. Further, was it justified to question the participation of the people of the country, envisioned through the role of eminent persons in judicial appointments, as a system of checks and balances? Surely, checks and balances are itself is a part of the basic structure of the Constitution. To be fair, while Justices Khehar and Goel said that the presence of eminent persons on the Commission itself was a problem. Justice Lokur's concern was not with the idea of eminent persons per se, but with the veto that was granted to them. However, even if the judges were concerned about the role of eminent persons, instead of invalidating the idea of the commission in its entirety, surely they could have read down the provision pertaining to the role of eminent persons. Concluding that their mere presence was violative of basic structure was not a sound conclusion. Further, concerns that the presence of the law minister as one member out of six on the NJAC amounted to conflict of interest on account of government being the largest litigant is, on the face of it, completely illogical. It is useful to recall that the law minister was intended to be only one of six members of the NJAC, and did not have any determinative role in the commission. Finally, the judgment does not really offer an alternative to the collegium system, despite at least one of the judges - Justice Joseph – clearly acknowledging that “the present Collegium system lacks transparency, accountability and objectivity” and “very serious allegations and many a time not unfounded too, have been raised that its approach has been highly subjective.” Yet, Justice Joseph joined majority to strike down the NJAC law. It is disturbing that the Court was comfortable that judicial independence would be safe in the collegium system, but thought that independence would be destroyed by the alternative in the 99th Amendment. The faults of the collegium are many. The process by which a judge is appointed to the High Court or the Supreme Court has been described by Justice Ruma Pal, a former judge of the Supreme Court, as “one of the best kept secrets in this country.” And the selection of judges, through the collegium system, suffers from biases of self-selection and in-breeding. The collegium functions like a club or cabal. 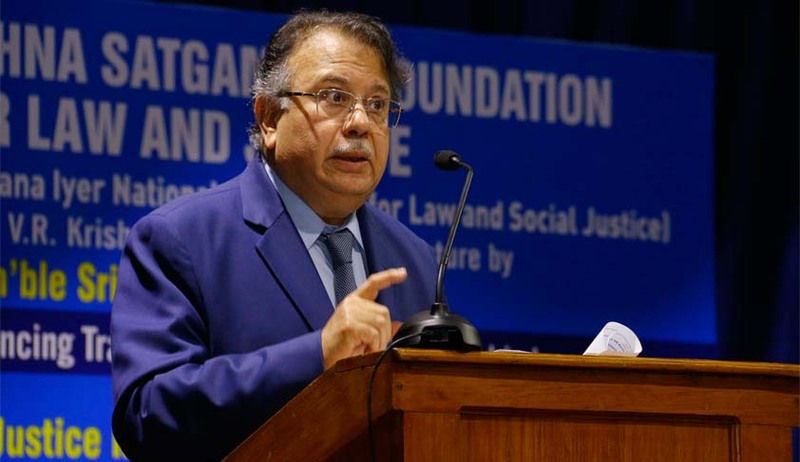 As commentator Ashok Malik describes it, the selection process for judges has its roots in personal connections by which children of influential lawyers and judges are placed in chambers of senior lawyers. Senior advocates are usually identified from this pool. The actual selection of judges is narrowed to being selected from this pool. He argues that an M.S. Dhoni could emerge from lower middle class India to captain the cricket team; but what are the odds that he could have become a judge in the Supreme Court if Dhoni been an exceptional graduate from a Ranchi law college? The collegium system conflicts with the intent of the framers of India’s Constitution; it detracts the judges part of the system from their principal judicial work of hearing and deciding cases; it resorts to ad hoc informal consultations with other judges, which consultations do not significantly investigate criteria such as work, standing, integrity and so on; it lays too heavy an emphasis on seniority in making appointments to the Supreme Court; assessments offered by judges during consultations are sometimes warped or tainted and sometimes better judges are overlooked or ignored. Additionally, the collegium system puts the Courts outside the sphere of legitimate checks and balances. In substance, the present collegium system of appointment lacks transparency, is inherently secretive, provides for no oversight and is out of step with democratic culture. It is evident that the collegium system cannot continue to exist in its present form. Until a viable alternative is found, though, reforms in the existing process of selection are urgently needed. This is precisely what Justice Chelameswar did, by his action of walking out of the collegium, and insisting on transparent procedures. It is difficult for anyone to argue that the present system is perfectly functioning. It is, therefore, imperative to not just voice support for transparency in the selection process, but also show that the judiciary wants to put this into practice. Transparency requires that there are clearly established criteria for selection, and that records of selection meetings are properly maintained with views of those who participated properly recorded, to ensure that selections were not arbitrary. The Supreme Court had a terrific opportunity to reform a system that it itself acknowledged as being flawed. But it did nothing. It did not amend the NJAC to have safeguards that would have made it constitutionally valid. It also did not reform the collegium in any way to address the various concerns voiced by one and all, including the Supreme Court itself. Unfortunately, as things have panned out over the past one year, the judiciary and the executive have been petulantly squabbling over the Memorandum of Procedure, in a power struggle for the appointment of judges. After asking the government to draft the Memorandum, the collegium quickly rejected both the proposals made by the government, first, of a screening committee for all prospective judges comprising eminent persons and retired judges to ensure criteria-based selections; and second, of a national security veto for the government. While the second proposal is definitely troubling, for the government cannot usurp veto power in the garb of national security, the rejection of the other proposal, of a screening committee, is inexplicable and there appears to be no rational explanation of why it has not been accepted, which was in fact suggested by the majority in the NJAC case. Even the process of formulating the Memorandum of Procedure has hardly been perfect. It appears that the role of the collegium is limited to accepting or rejecting reform suggestions given by the government. If true, this is disturbing, and if the Supreme Court is serious about reform, it must now propose reforms itself. More problematically, the secrecy of the process and the hostility between the judiciary and government has meant that the Memorandum of Procedure does not really seek to ensure real reform. Neither side shows any desire for change. Substantive proposals such as transparently outlining a zone of consideration, setting up a process for nominating and interviewing candidates, outlining criteria for appointment, clarifying the importance of seniority, presenting an annual report of candidates considered, interviewed, appointed and rejected and many others, suggested by so many, are all gathering dust. Subsequent accusations from the CJI that the government was delaying the files pertaining to appointments did not help to improve the situation. When the government eventually returned 43 of the 77 files due to certain objections, in just 5 days, the collegium reiterated 36 of the 43 the names that were originally proposed and rejected. It appears that the rest of the names have been deferred. This is likely to further escalate the tension. After 1970, such a confrontation is unprecedented, and far more intense. No one knows when or how it is going to end. Things have come to such a pass that it seems to me now that the judiciary and the executive are on a collision course. We must also understand that even if the current impasse between the executive and judiciary were to end, the vacancies would not be substantially filled, and certainly, the delays (which these vacancies are expected to address) would not have significantly reduced. The best way to break this impasse is to make all future correspondence on the Memorandum of Procedure public. This will transparently show how substantive reform is taking place (or not) and forcibly introduce a culture of transparency in judicial appointments. Otherwise, India will remain in the throes of a bitter power struggle where, regardless of whether the executive or the judiciary winning, it will be certain that the cause of justice will lose. Mr Parasaran, in a deeply insightful analysis of the NJAC judgment, suggests, as a future course of action, that all cases questioning the validity and/or interpretation of a constitutional amendment must be heard by a bench consisting of not less than 13 judges. And after thus amending the Constitution, the president may exercise his power to consult the Supreme Court by framing appropriate questions and making a reference under Article 143 to revisit the NJAC decision. The government should seriously consider making a constitutional amendment to this effect. Alternately, the court itself can provide by its own rule that cases pertaining to constitutional amendments will be heard only by 13 judges. It is moments like these when we remember personalities like Justice Krishna Iyer. After his retirement as Judge, Justice Krishna Iyer remained actively involved in public affairs and particularly, when things went wrong in the judiciary, we would hear his views from Kerala. We wish there were more people like him today, to remind us of our duties to our fellow citizens, and of the value of justice in a democracy.